This article is about the late wife of President Kennedy's son. For the daughter of U.S. President John Fitzgerald Kennedy, see Caroline Kennedy. Carolyn Jeanne Bessette-Kennedy (January 7, 1966 – July 16, 1999) was a publicist for Calvin Klein and the wife of John F. Kennedy Jr., the son of President John F. Kennedy and Jacqueline Onassis. After her marriage, Bessette-Kennedy's relationship with her husband and her fashion sense became the subject of media scrutiny, drawing comparisons to her mother-in-law. The couple and Bessette-Kennedy's older sister, Lauren, died in a plane crash off the coast of Martha's Vineyard in July 1999. Bessette was born in White Plains, New York, the youngest child of William J. Bessette, a cabinet maker, and Ann Messina, an academic administrator in the New York City public school system. She had two older sisters, twins Lauren and Lisa. Bessette's parents divorced when she was very young. Her mother later remarried Richard Freeman, an orthopedic surgeon, and moved to Old Greenwich, Connecticut, while Bessette's father stayed in White Plains. Bessette attended Juniper Hill Elementary School, where art teacher Linda Bemis recalled her as a shy but ordinary child. At Juniper Hill, Bessette's mother was a substitute teacher. Raised in a Roman Catholic household, Bessette later attended St. Mary's High School. At St. Mary's, Bessette was voted by her classmates the "Ultimate Beautiful Person". During her high school experience, Bessette was described as being part of the "in crowd" and having attended "all the right parties". She had initially started high school at Greenwich High School, but her parents transferred her to St. Mary's because they felt she was not taking her studies seriously. After graduating from high school in 1983, Bessette attended Boston University's School of Education, graduating in 1988 with a degree in elementary education. While there, she dated John Cullen, star of the school's ice hockey team, who would later play professional hockey in the NHL. Bessette briefly attempted a modelling career, and hired a professional photographer to take pictures for her portfolio. Although her modelling career did not prove to be profitable, she did appear on the cover of Boston University's calendar, "The Girls of B.U." After college and until her marriage to Kennedy, Bessette worked for Calvin Klein Ltd., a high-end American fashion house. During her successful career there, she went from being a saleswoman in the Newton (Massachusetts) Chestnut Hill Mall to becoming the director of publicity for the company's flagship store in Manhattan. While working for Klein in Boston, Bessette was noticed by Susan Sokol, a travelling sales coordinator for the company. Sokol, impressed with Bessette's grace and style, later recommended her for a position dealing with Klein's high-profile clients, such as actress Annette Bening and newscaster Diane Sawyer. By the time she left Calvin Klein, she was the Director of Show Productions earning a salary in the low six figures. Bessette first met Kennedy in 1992, while he was dating actress Daryl Hannah. Bessette and Kennedy began dating in 1994 and became a popular paparazzi target, and gossip columns detailed where they ate and shopped, and even covered their arguments. Paparazzi often waited outside the couple's Tribeca apartment to snap photographs. Bessette was introduced to John's uncle, Senator Ted Kennedy, in the late summer of 1994. Following the marriage, the senator would tell the press: "You could tell right away that there was something special between the two of them." Bessette moved into Kennedy's Tribeca loft in the summer of 1995, and the couple became engaged later that year. She quit her job at Calvin Klein in the spring of 1996. Kennedy and Bessette succeeded in keeping their September 21, 1996. wedding a secret from the press, avoiding media onlookers. The ceremony took place by candlelight on the remote Georgia island of Cumberland, in a tiny wooden chapel, the First African Baptist Church. The bride selected the then-little-known designer Narciso Rodriguez of Cerruti for her wedding dress of pearl-white crepe. The groom's older sister, Caroline Kennedy, was matron of honor, and Anthony Radziwill, the son of his aunt Lee Radziwill-Ross, served as Kennedy's best man. Caroline's two daughters, Tatiana and Rose, were flower girls, and her son Jack was the ring bearer. The couple honeymooned in Turkey. After the wedding, the media attention surrounding the couple intensified, and Bessette-Kennedy often found it difficult to deal with the harassment. When the couple returned from their honeymoon, a mass of reporters was waiting on their doorstep. John said, "Getting married is a big adjustment for us, and for a private citizen like Carolyn even more so. I ask you to give her all the privacy and room you can." Bessette-Kennedy was badly disoriented by the constant attention from the paparazzi. The couple was permanently on show, both at fashionable Manhattan events and on their travels to visit celebrities such as Mariuccia Mandelli and Gianni Versace. She told her friend, Carole Radziwell, that the only way to avoid the paparazzi was to leave her apartment at 7 in the morning. She also complained to her friend, journalist Jonathan Soroff, that she could not get a job without being accused of exploiting her fame. Her minimalist "throwaway chic" fashion sense was chronicled by various fashion publications and drew repeated comparisons to her mother-in-law, former First Lady Jacqueline Kennedy Onassis. While the interest surrounding the couple continued, Bessette-Kennedy refused to give interviews and turned down offers to appear in fashion magazines. Towards the end of her life, Bessette-Kennedy became more involved with charity work and often accompanied her husband to dinners at the White House (the couple were given a tour by President Bill Clinton in March 1998) and acted as the hostess for parties for her husband's political magazine George. According to some reports published after their deaths, the Kennedys were experiencing marital problems and contemplating divorce in the months preceding their deaths. The couple had various disagreements, including her refusal to start a family, John’s work on the George magazine where she felt forsaken, and her dislike of John’s publishing partner Michael Berman. According to Vanity Fair, Bessette-Kennedy's "insecurity fueled a need to control and manipulate; her frequent use of cocaine made her paranoid". Moreover, Bessette-Kennedy was jealous of and barely on speaking terms with her sister-in-law Caroline Kennedy, who reportedly criticized the bride for being late to her own wedding and wearing heels on the beach. Although it has been widely reported that the couple were experiencing marital problems and contemplating divorce, close friends refute the divorce claim. Robert Littell, who spent the weekend with John and Carolyn a week before their deaths, also refutes that the couple were living apart at the time of their deaths. In his book, The Kennedy Curse: Why Tragedy Has Haunted America's First Family for 150 Years, author Edward Klein claimed that the couple's problems reportedly stemmed from Bessette-Kennedy's difficulty dealing with the media attention surrounding her and the marriage, accusations of infidelity, disagreements about having children, and Bessette-Kennedy's alleged cocaine use. Although Klein is the author of several Kennedy books, John Kennedy Jr. said, when speaking of Klein, "he is a guy who had lunch with my mother twenty years ago and has been dining out on it every since." Friends of the couple, including John Perry Barlow and Christiane Amanpour, said that Bessette-Kennedy and Kennedy fought on occasion and that Bessette-Kennedy had trouble adjusting to the intense media coverage, but denied that she used drugs or that the couple was planning to divorce. The couple began seeing a marriage counselor in March 1999 and sought counseling from Cardinal John O'Connor in the summer of 1999. Bessette-Kennedy died on July 16, 1999, along with her husband and older sister Lauren, when the light plane that he was piloting crashed into the Atlantic Ocean off the western side of Martha's Vineyard. The National Transportation Safety Board (NTSB) determined that the probable cause of the crash was: "The pilot's failure to maintain control of the airplane during a descent over water at night, which was a result of spatial disorientation. Factors in the accident were haze and the dark night." After a five day search, the wreckage was discovered in the late afternoon of July 21. The bodies were recovered from the ocean floor by Navy divers and taken by motorcade to the county medical examiner's office, where autopsies revealed that the crash victims had died upon impact. At the same time, the Kennedy and Bessette families announced their plans for memorial services. Toxicology testing was conducted on the pilot and passengers. All were negative for alcohol and drugs. In the late hours of July 21, the three bodies were taken from Hyannis to Duxbury, where they were cremated in the Mayflower Cemetery crematorium. On the morning of July 22, their ashes were scattered from the Navy ship USS Briscoe off the coast of Martha's Vineyard. Before marrying Kennedy, Bessette was in a relationship with Calvin Klein model Michael Bergin, who wrote a memoir titled The Other Man: John F. Kennedy Jr., Carolyn Bessette, and Me, which was published in 2004. In 2004, Kennedy's fellow Brown University alum and ex-roommate, Robert T. Littell published, The Men We Became: My Friendship With John F. Kennedy Jr. In 2005, Bessette-Kennedy's close friend Carole Radziwill, wife of John's cousin Anthony Stanislas Radziwill, published a memoir entitled What Remains: A Memoir of Fate, Friendship and Love, that includes her memories of the plane crash that took place just weeks before her own husband's death from cancer. In 2012, Kennedy's assistant and publicist, RoseMarie Terenzio, published her experiences and behind-the-scenes observations based on her five years working with Kennedy and, eventually, her friendship with him and his wife in Fairy Tale Interrupted: A Memoir of Life, Love, and Loss. Rosamund Pike was encouraged by Gone Girl director David Fincher to base her character, Amy Dunne, on Bessette-Kennedy. Fincher said of Bessette-Kennedy, "She crafted herself, she re-invented herself, and invented that persona. That's where I began." Pike searched unsuccessfully for audio of her, though she would concede her character should be created from the "outside in." In 2015, Wes Gordon, known for disliking discussion about the influences of his collections, admitted Bessette-Kennedy's impact on the clothing for women in that year's collection. Gordon was long interested in Bessette-Kennedy's style prior to production. ^ Florio, Gwen (July 18, 1999). "Before Kennedy, She Made A Mark Carolyn Bessette's Beauty And Brains Took Her Places. Some Saw The Couple As A Natural Match". philly.com. Retrieved October 6, 2014. 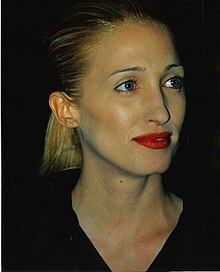 ^ a b "Carolyn Bessette Kennedy, Private Woman Who Was New to Fame". Primo-standard-lb.hosted.exlibrisgroup.com. Retrieved November 22, 2015. ^ Abraham, Yvonne; Cassidy, Tina (July 19, 1999). "For Bessette Kennedy, joining Kennedy clan meant life in a fishbowl". boston.com. Retrieved October 6, 2014. ^ a b "Crazy For Carolyn". newsweek.com. October 10, 1996. Retrieved October 6, 2014. ^ Heymann, C. David (2008). American Legacy: The Story of John and Caroline Kennedy. Simon and Schuster. p. 405. ISBN 0-743-49739-2. ^ a b c d e f g h i j Bumiller, Elisabeth (September 29, 1996). "Enter Smiling, the Stylish Carolyn Bessette". NYTimes.com. Retrieved November 22, 2015. ^ a b "Washington Post". The Washington Post. 9 October 1996. ^ Gliatto, Tom (1996). "Bridal Sweet". People Magazine. Retrieved August 26, 2011. ^ Gliatto, Tom (October 7, 1996). "Bridal Sweet". People. 46 (15). ISSN 0093-7673. ^ Waldman, Amy (July 19, 1999). "Carolyn Bessette Kennedy, Private Woman Who Was New to Fame". nytimes.com. Retrieved October 6, 2014. ^ a b Klein, Edward (August 2003). "Secrets and Lies". vanityfair.com. Retrieved October 6, 2014. ^ Heymann 2008, p. 416. ^ Gerhart, Ann (October 18, 1996). "Who's That Girl? Quite Possibly the Perfect Match". latimes.com. p. 2. Retrieved October 6, 2014. ^ a b c Smolowe, Jill (July 24, 2000). "To Have and To Hold". People. 54 (4). ISSN 0093-7673. ^ a b Radziwell, Carole (2005). What Remains. New York, NY: Simon and Schuster. ^ Kranish, Michael (July 22, 1999). "Extra search effort was 'the right thing'". boston.com. Retrieved October 6, 2014. ^ "Sitting Target". theguardian.com. July 21, 1999. Retrieved October 6, 2014. ^ Terenzio, Rosemary (2012). Fairy Tale Interrupted: A Memoir of Life, Love, and Loss. Gallery Books. ^ Rogers, Patrick (July 21, 2003). "Imperfect Union". People. 60 (3). ISSN 0093-7673. ^ Heymann 2008, p. 487. ^ Klein, Edward (2004). The Kennedy Curse: Why Tragedy Has Haunted America's First Family for 150 Years. Macmillan. p. 114. ISBN 0-312-31293-8. ^ "NTSB Press Release". Ntsb.gov. July 6, 2000. ^ "Crash and Search Time Line". washingtonpost.com. July 22, 1996. ^ Maxwell, Paula (July 28, 1999). "Kennedy Cremated In Duxbury" (PDF). Duxbury Clipper. Archived from the original (PDF) on January 4, 2014. ^ Gellman, Barton; Ferdinand, Pamela (July 23, 1999). "Kennedy, Bessettes Given Shipboard Rites". The Washington Post. pp. A1. Retrieved May 22, 2008. ^ Peterson, Todd (May 29, 2004). "'Baywatch' Cad Talks Up Bessette Affair". people.com. Retrieved October 6, 2014. ^ Littell, Robert T. (2013). The Men We Became: My Friendship with John F. Kennedy Jr. St. Martin's Press. 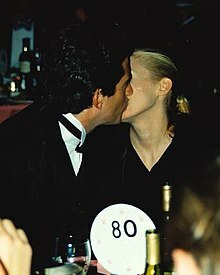 ^ "JFK Jr., Carolyn Bessette's Lives and Last Moments Remembered". abcnews.com. September 20, 2005. Retrieved October 6, 2014. ^ Issac, Cheryl (February 9, 2012). "From Executive Assistant To Entrepreneur: JFK Jr.'s Former Assistant Says It Was 'The Perfect Storm'". forbes.com. Retrieved October 6, 2014. ^ "Rosamund Pike's Gone Girl Character Inspired By Late Carolyn Bessette-Kennedy". Filmibeat. June 19, 2015. ^ Givhan, Robin. "How Carolyn Bessette-Kennedy inspired Wes Gordon". canada.com. Waldman, Amy. "Carolyn Bessette Kennedy, Private Woman Who Was New to Fame." New York Times July 19, 1999. Academic OneFile. Web. October 24, 2014. "The Woman Who Won His Heart: She had an uncommon grace and made him think. Now the Bessettes face the loss of two daughters." Newsweek July 26, 1999: 44. Academic OneFile. Web. October 24, 2014. Bumiller, Elisabeth. "Enter Smiling, the Stylish Carolyn Bessette." New York Times September 26, 1996. Web. October 24, 2014. Collins, James and Angelo, Bonnie et al. "By George, he got married!" Time October 7, 1996. Vol 148. Issue 17. p66. This page was last edited on 26 March 2019, at 18:09 (UTC).